If you wish to lose weight and feel more vibrant, pain-free, and energized, Dr. Bret Mosher can help. Dr. Mosher is an expert in the field of natural medicine who creates fully customized plans for patients seeking to achieve both whole body health and weight loss. At his practice in Poway, CA, Dr. Mosher helps patients live healthier lives with a complementary approach that integrates the most relevant aspects of Western and Chinese medicine. Achieving and maintaining a healthy weight is not feasible with a one-size-fits-all diet plan. Instead, Dr. Mosher will identify your unique genetic expression to design a health plan that helps you to lose weight through a multi-faceted, comprehensive approach. Contact us to schedule a personal consultation with Dr. Mosher. Your consultation will begin with a thorough assessment that will help Dr. Mosher understand your unique needs and goals. 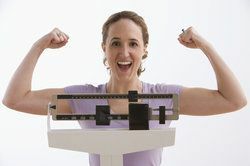 In order to identify the causes of your weight gain, he will analyze all of the circumstances that may be affecting it. If you are overweight, your body is not functioning properly. No two bodies work exactly the same, and Dr. Mosher can find the imbalances. During his assessment, he will use state-of-the-art diagnostic tools such as the AcuGraph® System to measure energy blockages, and a bioimpedance analysis to electronically assess the composition of your body. A cholesterol test, hemoglobin A1c blood test, and food and chemical allergy tests can also provide pertinent information. Metabolic typing is another important aspect of the analysis. Your metabolism is unique, and the same foods that others eat to stay slim may be contributing to your weight gain and lack of energy. As a culture, we are narrowly focused on burning calories to reach a goal weight. In contrast, Chinese medicine views health in terms of our supply and flow of “qi,” which is simply another word for energy. Dr. Mosher will use the information from his assessment to develop your customized weight loss and whole body health plan. This functional approach is based in part on treating the whole person, rather than viewing the mind and body as separate entities. Your plan may include making changes in your environment, starting exercise, and reducing stress. Advanced clinical nutrition counseling and traditional Chinese medicine will play important roles in your treatment. Dr. Mosher is an authority on individual nutritional counseling. Your metabolic typing provides information regarding the correct balance of protein, fats, and carbohydrates for your body to promote optimal function and healthy body weight. If results from your hemoglobin A1c blood test reveal a need to regulate your blood sugar, Dr. Mosher will prescribe appropriate therapies. Weight problems can also derive from poor digestion, nutritional deficiencies, and infections in the gut. All of these can be addressed by properly adjusting your diet. Traditional Chinese medicine was developed over thousands of years, and will play a key role in your quest for a healthy weight. The practice comprises the use of acupuncture, herbs, movement activities, and meditation, in addition to nutrition counseling. As a culture, we are narrowly focused on burning calories to reach a goal weight. In contrast, Chinese medicine views health in terms of our supply and flow of “qi,” which is simply another word for energy. Strong, well-balanced qi enhances the ability to achieve and maintain a healthy weight. As a doctor of Oriental medicine, Dr. Mosher has the knowledge and experience to help you strengthen, channel, and sustain qi in order to achieve your weight loss and health goals. Healthy body weight and optimal overall health are within your reach. To learn more about how Dr. Mosher's functional approach to weight loss can benefit you, please contact us today.